My mom passed away 5 weeks ago tomorrow. WOW, still doesn't seem real. At her service I made a speech and spoke of my mom's favorite cocktail. The Manhattan. For the past 5 weeks I have on and off heard the mention of her Manhattan and then the other day one of my cousins asked for the recipe. Which reminded me that I need to share it with the world. Now my mom was VERY particular with her cocktails.......especially this one! Her Manhattan had to be Per-Fect! There is a local restaurant in our city that you can go to and order a "Judy Manhattan" and they'll know EXACTLY what you want. No kidding!! "I would like a Dry VO Manhattan......UP......with 4 drops of bitters, a cherry and a twist....and a splash of cherry juice." I can literally hear her saying it now. Anyways, I knew that I wanted to give you all a brand new cocktail.......and I knew that it had to be my mom's Manhattan. Plain and simple. 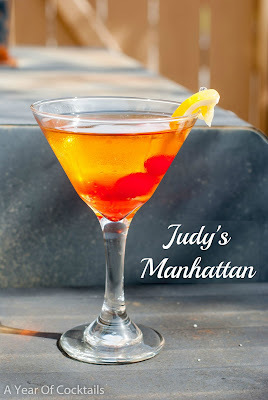 Let's get to making this Manhattan shall we? In a shaker, add ice, VO, dry vermouth and bitters. Pour in a splash of cherry juice and garnish with a cherry and lemon twist. There it is! My mom's favorite cocktail to enjoy! I hope you all have a wonderful weekend. We have a weekend filled with softball opening day and a softball game. Fingers crossed that the rain doesn't ruin our plans.